When I decided to rehabilitate my cocoa farms, my neighbors were very surprised. In order to plant new seedlings, I had to cut down trees that were still bearing fruit and providing income. Some of the other farmers discouraged me. They were concerned that it would take years before I could harvest again. But I was determined. My trees were 28 years old, and their yield was minimal. In the Cocoa Life training on Good Agricultural Practices, I learned that keeping them didn’t make economic sense. This was confirmed when I toured the demonstration plots. Their flourishing trees looked nothing like mine. I made it my goal to transform my farms. 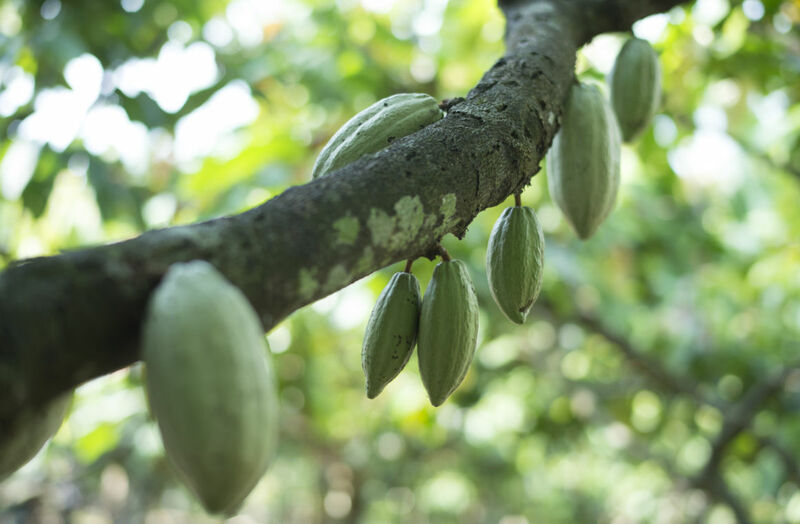 Through Cocoa Life, I received high-quality seedlings from Tree Global. They use the right medium instead of regular soil, and plastic containers to protect the rooting system. They also use shading nets to protect the seedlings from the sun. I was pleased with these plants, but the rehabilitation was challenging. It took about two to two and a half years for the seedlings to fruit. During this time, my family’s income was cut short. It was a struggle. To survive, I rehabilitated my farms in phases and depended on other food crops that I cultivated. As the trees grew, I adopted the Good Agricultural Practices that I learned. Pruning is important because it allows the trees to grow the most fruit. Before the training, I was only thinning my trees. Now, I remove branches that are diseased and those that provide excess shade, which allows more sunlight to filter in. I use a ladder, machete and pruner to reach the higher branches. Throughout the rehabilitation, Community Extension Agents visited my rehabilitated farms and offered advice on regular basis. My struggles and efforts have paid off. Today, I have beautiful trees. One of my neighbors said that he thinks I use black magic, because there is always fruit to harvest. After seeing my farm, many of the other farmers have signed up for the Cocoa Life program. I believe that these changes will sustain the future of cocoa, because farmers will benefit from the improved planting material to produce more yield. Because of the adoption of Good Agricultural Practices , my own income has increased tremendously. I can take care of my family, and my children will receive the best education. My decision to rehabilitate my farms through Cocoa Life has transformed my life for the better. "Access to quality planting materials is key for improving a farmer’s yield. Our seedlings are grown in state-of-the-art nurseries, so they are hardier and produce more cocoa pods than those available locally. By replacing old and diseased trees with our seedlings, farmers can maximize their productivity. This can improve their income and, ultimately, their quality of life."